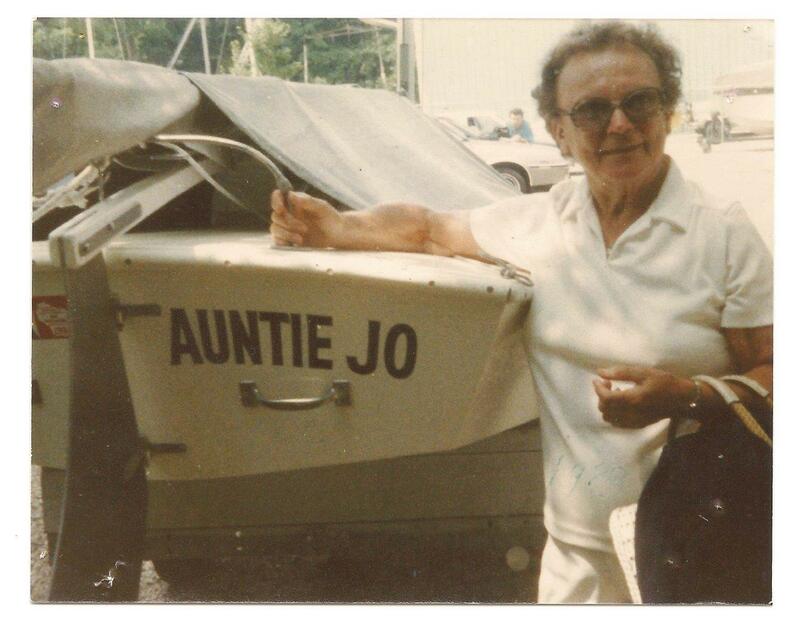 Yes, there really was an Aunty Jo at Lake Geneva Yacht Club, and she is remembered with great affection. Aunty Jo’s more formal name was Josephine Kitrush Burton (1906 – 1995), and she and her husband, Blake, who was general manager of the Geneva Lake Boat Company, joined the Yacht Club in 1945. Jo Burton’s nephew called her Aunty Jo, and before too long so did everyone else. In 1958, Jo and Blake Burton donated the Aunty Jo Perpetual Trophy, a sterling silver vase, to the Yacht Club to be awarded each year to the skipper who wins the most races during the season in any class in which seven or more boats compete. 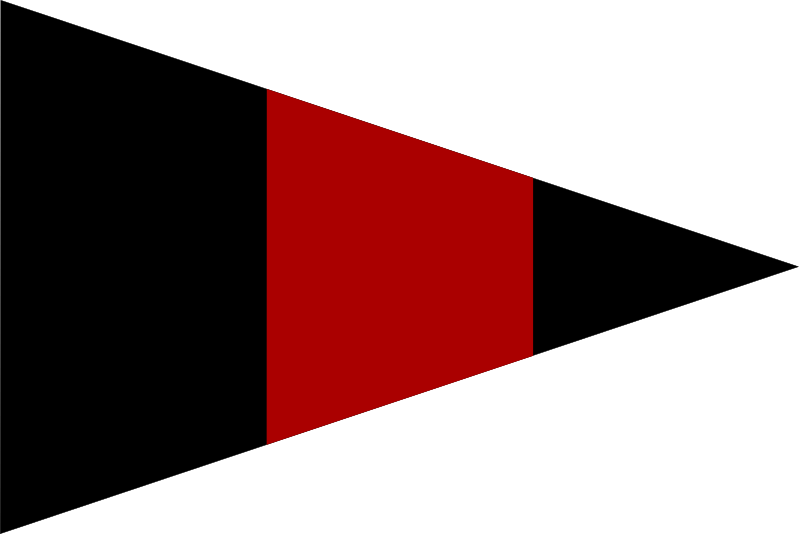 In case of a tie, the trophy is awarded to the skipper in the class in which the largest number of boats participated in a championship series. (There have been unbreakable ties four times.) Early yearbooks call it the Skipper’s Trophy. Jo Burton served the Yacht Club as a trustee, a member of the social and the women’s committees, a judge, and as a principal race officer and valued member of the race committee for which she received the Dr. and Mrs. Will F. Lyon Trophy in 1969 and 1979. “She became a student of the racing rules,” recalls a long-time sailor, race committee member, and judge, “and she officiated at ILYA Class X regattas. Her motto was ‘Live life to the fullest!’” From 1963 to 1981, Jo Burton was the Yacht Club’s first executive secretary, and the board of directors named her executive secretary emeritus after her retirement. One former X-boat sailor, later commodore, remembers those days in the 1960s and said that her office door “was always open to us kids, who very much enjoyed her company.” In 1968, the Burtons donated the Blake Burton Parent Trophy to the Yacht Club for X-boat competition by parents and their children. In appreciation for Jo Burton’s ongoing contributions, the club officers dedicated the 1978 yearbook to her, noting that she “has probably spent more time on the Flagship than anyone and helped teach others to set the course, fire guns, and record the results. Her cheerful smile and willingness to help have made life at Lake Geneva Yacht Club more pleasant for all of us.” She was also a member of the board at the Sailing School, and when members gave the Sailing School four new X-boats the officers named one of them in her honor. Jo Burton received the 1981 Marie Kramp Award for outstanding service. “She was always so proud of the Yacht Club and the accomplishments of the members there, of Buddy and Jane and so many of the sailors,” said Jo Burton’s granddaughter Sara Burton Zick. “ She was a cool grandma.” The first winner of the Aunty Jo Perpetual Trophy, in 1958, was Larry Stevens (sailing Jo Burton’s Class X I-9 Tow Head). The most recent winner, in 2012, was Erick Youngquist (Class C), his second Aunty Jo title. Record trophy holders to date are Jane Pegel with ten wins (Classes M and Sonar), Brian Porter with eight wins (Class E), and Cuppy Goes with six wins (Class C). Is your name on the Aunty Jo Perpetual Trophy? Find out by clicking here to reach the online LGYC Virtual Trophy Room’s Special Awards.